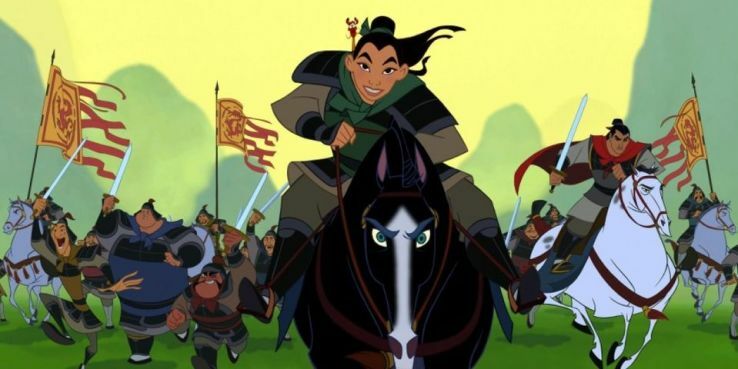 Hulu continues to bolster its growing online profile with a new exclusive deal for a library of Disney films including Mulan and Pocahontas. The multi-year deal makes Hulu the only subscription streaming video service able to offer the collection of 50-plus animated and live-action films including The Nightmare Before Christmas, Air Bud and Sister Act. Many of the movies are available to stream now. This is Hulu's first deal for Disney theatrical releases -- and its largest catalog deal with a studio -- but Hulu and Disney already play nice. Earlier this year, Hulu reached a deal with The Disney-ABC Television Group to stream Disney Channel and its family of kids' programming networks as well as more than 20 Disney Channel Original Movies. The agreements land ahead of Hulu's planned live streaming service, scheduled to launch this year. For now, Hulu's subscription service is delivered on demand: a $7.99 monthly tier has limited advertising, while an $11.99 tier has no commercials. The Walt Disney Company owns a 30% stake in Hulu, which launched in 2008, as does Comcast (NBCUniversal) and 21st Century Fox. Time Warner became a 10% stakeholder in August. Others among the 50-plus titles that will land on Hulu in the coming months: Lilo & Stitch, Tarzan, The Emperor's New Groove, Muppet Treasure Island, The Princess and the Frog, Con Air, Gone in 60 Seconds, The Mighty Ducks, Pearl Harbor, Step Up, and Romy and Michele's High School Reunion. This collection of older Disney films does not include recent releases such as the recent release Star Wars: Rogue One, as Netflix has streaming rights to Disney films released in 2016 and beyond. Battle Lines: One of the biggest growth areas for internet-based streaming services is with children. There’s a reason why in addition to letting you set up your own viewing profile, Netflix offers a built-in “Kids” option that acts like a depository for the service’s kids-themed shows and movies. And few things say “kids” more than Disney. I can personally speak to that after my wife and I took our daughters to see Disney’s latest hit movie, “Moana,” over the Christmas weekend. Well, if you happened to be looking for something to watch over the last week or so, and you ventured away from Netflix, you might have gone over to Hulu and stumbled across director Tim Burton’s “The Nightmare Before Christmas.” Or, “Mulan.” Or “Pochahontas.” And that wasn’t any kind of mistake because thanks to a new content-licensing deal, Hulu has gotten its hands upon 56 Disney films on an exclusive basis. Some of these had been on Netflix. (Oh, if I had a dollar for every time my daughters turned on Netflix and watched “Mulan.”) And some of them might not fall into the “kids” category. (Hey, I love the over-the-top performances of Nicholas Cage and everyone else in “Con Air,” but it’s not meant for second-graders.) But there is no doubt that Hulu’s deal is meant to attract kids, and the families that come with them, to the streaming subscription service. There are some caveats, however. Hulu’s deal with Disney is only for films that have already been released. And there are only so many of them. This contrasts with a deal that Netflix has with Disney for certain titles, most notably new Disney theatrical releases beginning this year. That’s why you’ve been able to watch “Zootopia” and the most-recent version of “The Jungle Book” on Netflix over the past few months. But, the point is that Hulu, with its more than 12 million subscribers, isn’t rolling over when faced with Netflix and its more than 47 million subscribers in the U.S. (and almost 87 million worldwide). There remains room for multiple streaming services in peoples’ living rooms, as long as they have the content for which people are willing to pay. Now, if someone would just start streaming the “Star Wars” movies. Snapping up a Deal: In case you missed it, and with Christmas being on the weekend this year, chances are good that you had a few things on your mind other than thinking about Snapchat. But, it looks like Snap, which owns the Snapchat social networking app, did a little last-minute Christmas shopping right before the holiday. The company reportedly spent between $30 million and $40 million to acquire augmented reality technology company Cimagine Media. Cimagine, based in Israel, does a lot of stuff, including computer vision, real-time image processing, mobile development and international marketing. The company focuses on app-based e-commerce, which is something Snap is working on building up as the company grows and prepares to go public in an IPO that could come some time in 2017. Movin’ on Up: Gains came from Nvidia, SunPower, Yelp, Lending Club and Advanced Micro Devices. In the Red: Decliners included Impax Laboratories, Glu Mobile, Quotient Technology, Ultra Clean Holdings and Nektar Therapeutics. The tech-focused Nasdaq Composite Index rose 0.5 percent to reach 5,487.44. The blue chip Dow Jones Industrial Average edged up by 0.1 percent to end the day at 19,945.04. And the broad-based Standard & Poor’s 500 Index added 0.2 percent to finish at 2,268.88. 0 Response to "Hulu is getting over 50 Disney movies thanks to new licensing deal"